NEW YORK - A New York City Police officer responding to a report of a break-in at a Brooklyn apartment Monday morning was shot in the face and killed by one of the suspects hiding in a side room when officers arrived, police officials said. Officer Peter Figoski was pronounced dead at 7:17 a.m. at a hospital just hours after the shooting, authorities said. 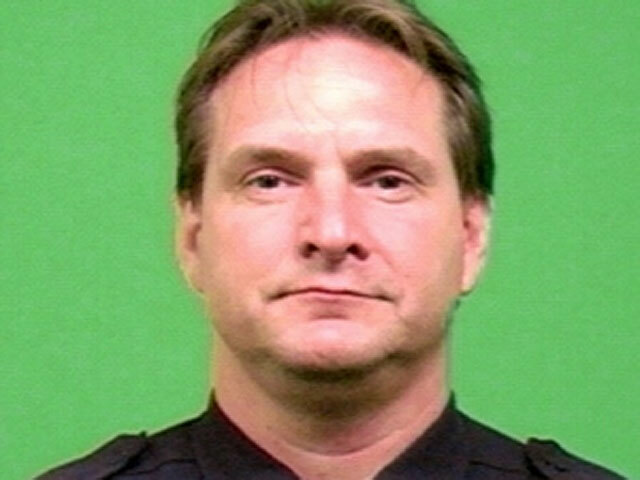 The 22-year veteran police officer was part of a back-up team of officers who responded to a report of a break-in at the basement apartment in the East New York section of Brooklyn, Police Commissioner Raymond Kelly said. The building owner, who lives on the first and second floors, called 911 at about 2:15 a.m. The two suspects had tried to flee, but couldn't find a way out through the back and were hiding in a room as officers walked past them and started to interview the tenant and a neighbor. They were trying to escape through the front when they ran into Figoski. He was shot once. Figoski's partner, Glenn Estrada, was struggling with a second suspect in front of the house when he heard the shot and watched the suspect running away. He chased after him for blocks before capturing him, Kelly said. Lamont Pride, 27, was being held and is facing murder charges. It's not clear when he would be arraigned, and there was no information on whether he had an attorney. Police recovered a silver semi-automatic pistol under a parked car near where Pride was arrested. There was one round discharged from the weapon, and the shell casing had jammed inside the gun. Kelly said the gun had ten other live grounds and the gunfire could have been worse had the weapon not jammed. Figoski, 47, of West Babylon, N.Y. was divorced and has four daughters, two in high school and two in college. He been on the force 22 years, with more than 200 arrests and had 12 medals awarded, including 8 for exceptional police duty. The tenant told police he heard the suspects pounding on the basement door, claiming to be police. They broke down the door and demanded money, pistol-whipped him and took $770 in cash and a watch, police said. The tenant works at a nearby bodega and told police one person was wearing a ski mask. A ski mask was recovered on the street corner where Pride was arrested.